Did you guess that is what I was going to say? I worked for over six months developing the patterns for this book. I only included the best ones. 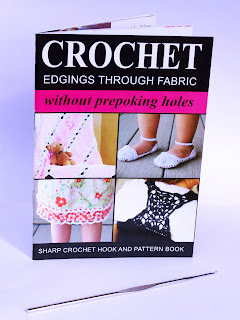 I was able to come up with many fresh ways to use the Sharp Crochet Hook. I think you will all be happy when you get it! I am so happy with how it turned out! Here is the Sharp Crochet Hook and Pattern Book Combo Pack in it's awesome packaging (the plastic opens and closes so it can be reused). It also has a hang hole so retailers will be happy. This picture isn't that great, but it gives you an idea. A huge thanks to Nicole Leavitt- www.nicoleleavitt.com for the stellar photos in the book. 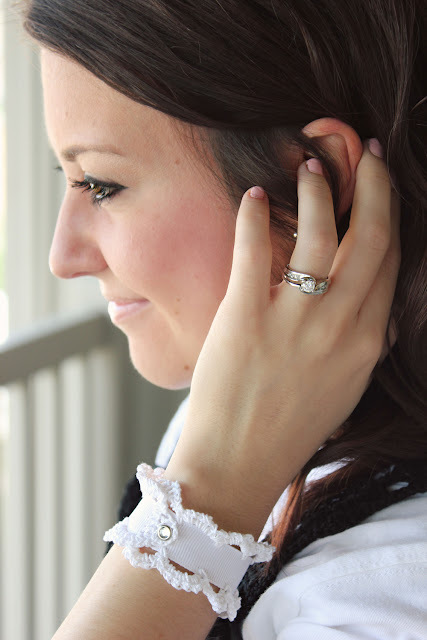 And a huge thanks to Amanda Crowther for modeling! Plus, aren't the kids darling? I'm so lucky to have such talented people to work with. If you guys need a photographer or a model, Nicole and Amanda are highly recommended! Sharp Crochet Hook Pattern Book (p. 6) The Sharp Crochet Hook easily crochets through knit and denim! 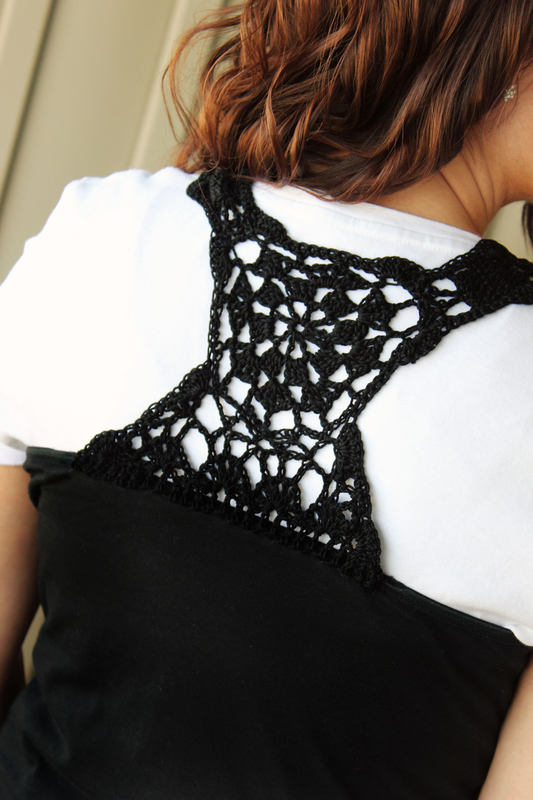 Sharp Crochet Hook Pattern Book (p.13) Easily embellish a tank top with this beautiful pattern. 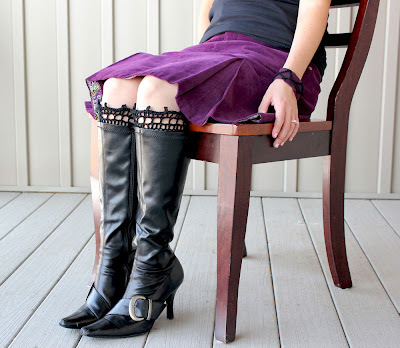 Sharp Crochet Hook Pattern Book (p.15) Transform a pair of men's dress socks into these boot socks. Would be an excellent Christmas gift for a friend or daughter! And it only takes about an hour! 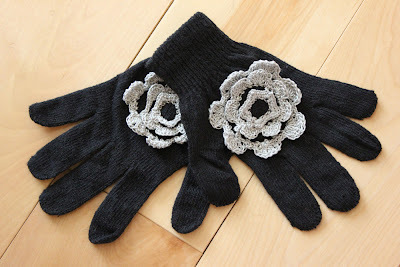 Sharp Crochet Hook Pattern Book (p.8) Embellish a pair of everyday one size fits all gloves with this flower. Would be an excellent Christmas gift for a girl! 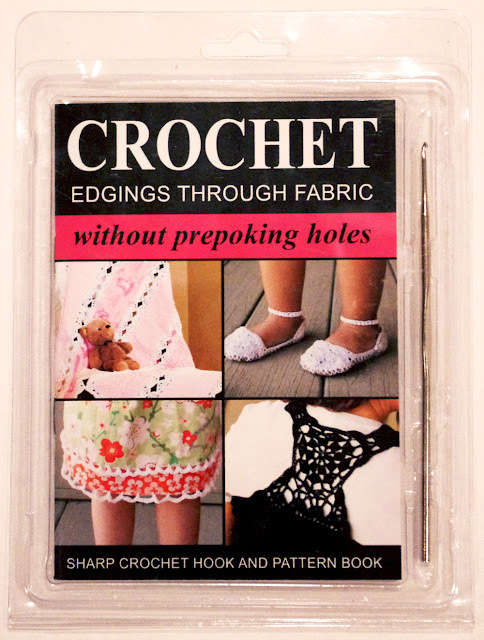 Sharp Crochet Hook Pattern Book (p.7) These baby shoes are great because you crochet the upper part directly into faux-leather. 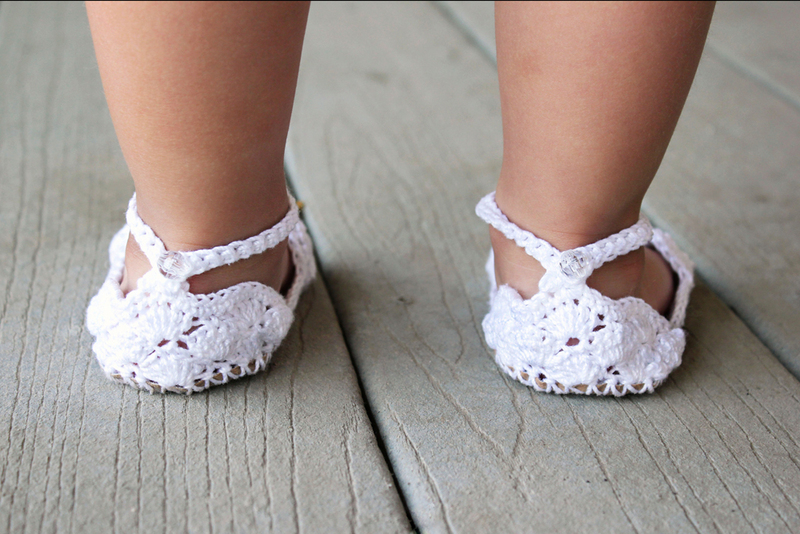 The sole is much more durable than the traditional "baby-booties." Sharp Crochet Hook Pattern Book (p.9) Make a children's room name plate! 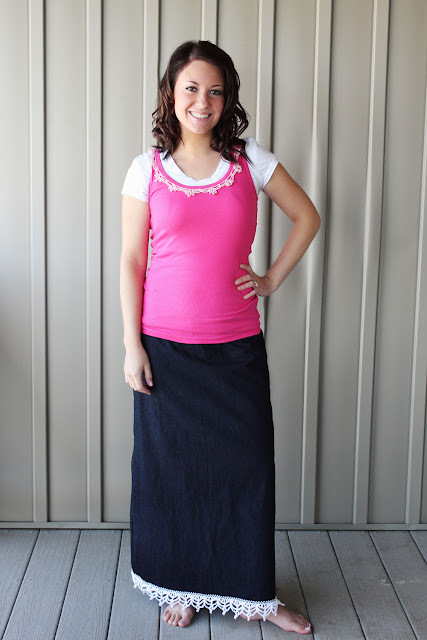 So quick, easy, and cute! Sharp Crochet Hook Pattern Book (p.12) Use a kitchen towel or bandana and make a really cute apron! This would be a great Christmas or Birthday gift idea! Sharp Crochet Hook Pattern Book (p.18) Crochet an edging on ribbon to make a really great looking bracelet! 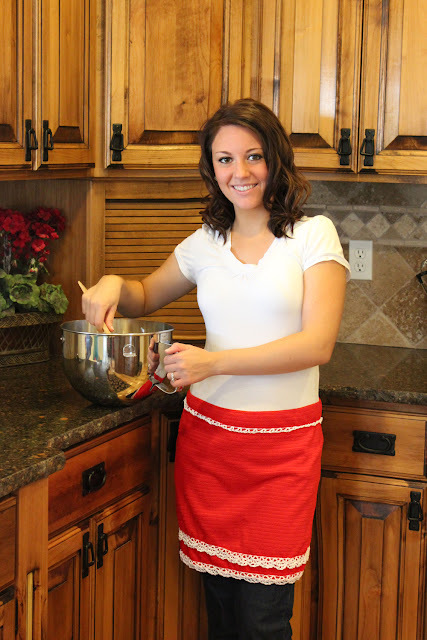 Another great quick gift idea! 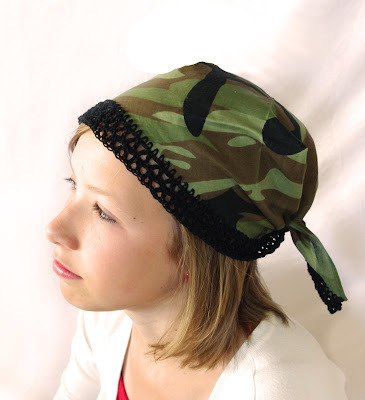 Sharp Crochet Hook Pattern Book (p.5) Crochet an edging on a bandana. This would be so cute for Girl's Camp! Sharp Crochet Hook Pattern Book (p.11) The Sharp Crochet Hook goes through flannel so easily. 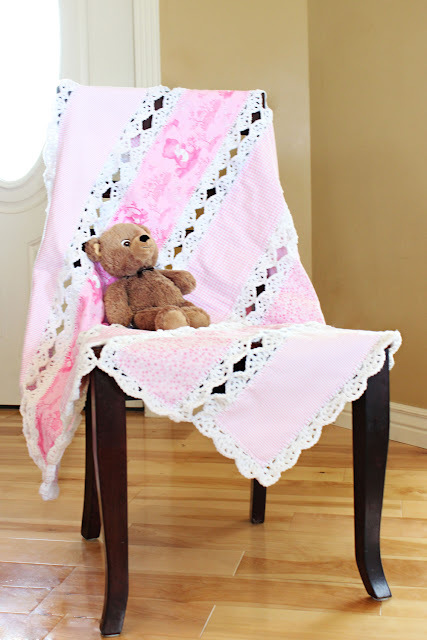 This pattern shows you how to crochet around 5 double layer strips of flannel to create this stripe blanket.You use the Sharp Crochet Hook and crochet thread to make the first layer, then you use normal worsted weight yarn and a larger hook to make the scallop edge. I hope you guys enjoy the book! 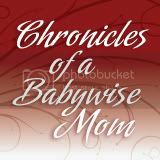 I do wholesale pricing if you would like to sell the book in your shop (online or brick and mortar), or if you are a crochet teacher. 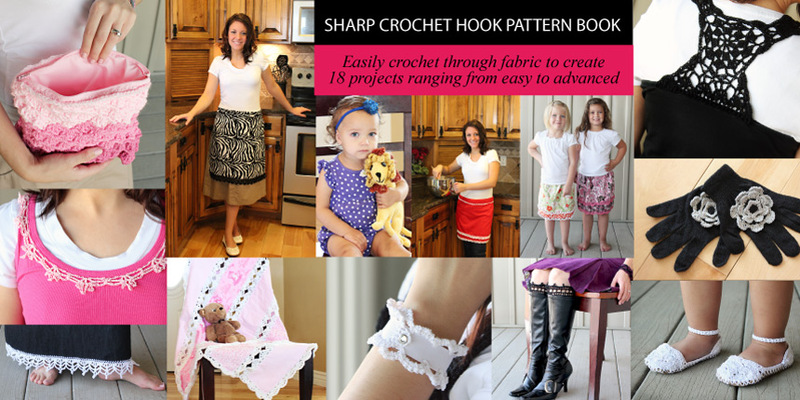 Please email me at jessica@sharpcrochethook.com for more information. You are amazing! Congrats on the new book! What a great idea to go along with a great product! I am teaching myself how to crochet, would this be something I could do?